In an article coming out next month (Vol 30, 2010) in the Journal of Public Administration and Development I responded to an invitation to write about the future of development management from a complexity perspective. This involved forming a view as to whether there is such a thing as development management, as well as dealing with ideas about how the future arises from the present. On what basis might one predict a future for anything, and what would these predictions say about our theories of causality? 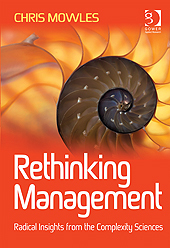 The article argues that development management borrows heavily from management ideas that prevail in other sectors, particularly but not exclusively, New Public Management. In other words, many of the concepts, assumptions, grids, frameworks and instruments of management that get taken up widely in the public sector, and in the private sector, are also widely used in development organisations. One is just as likely to find managers in development organisations talking about their ‘niche’ and their ‘brand’, undertaking strategic planning, setting ‘stretch targets’, and worrying about effectiveness and efficiency as in any other sector. There are obvious differences, but at the same time managers in development organisations are working with very similar theories, implicit or explicit, to those adopted by managers in all kinds of other organisations. Is this such a surprise if they have management qualifications from the same business schools? This entry was posted in complexity, emergence, international development, management, organisations, politics, power, reflective practice, reflexivity, Uncategorized and tagged aid, complex adaptive systems theory, complexity sciences, development management, emergence, future, ideology, managerialism, politics, reflexivity on February 10, 2010 by Chris Mowles.